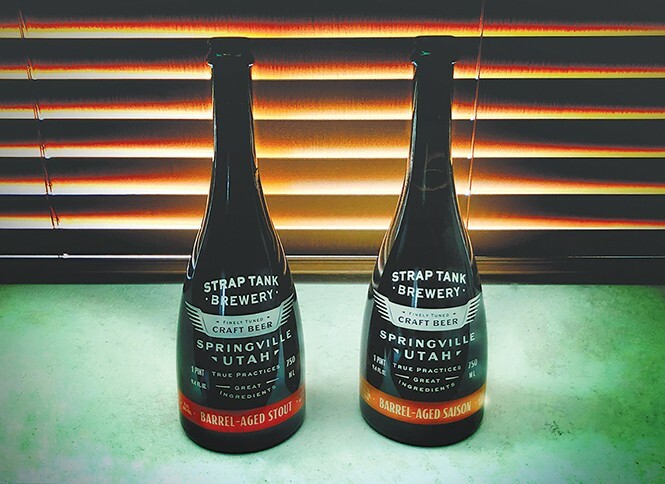 Strap Tank Brewing Co. barrells into aged beers. "Utah County" and "craft beer" aren't usually uttered in the same sentence together. When they are, they're usually accompanied by the name Strap Tank Brewing Co. Since May 2016, the Springville brewery has reawakened a passion for craft beer that Utah County hasn't seen since the pre-Prohibition era. Now that Strap Tank has established itself with more common styles, it's time to unleash their prowess with barrel-aged beers. You'd better strap in. Barrel-Aged Stout: Poured from Strap Tank's teardrop-shaped bottle is a handsome and viscous-looking stout that's completely opaque when held to the light. The foam sits tall for a while, then eventually deflates into some chunky, pocky islands. Upon first sniff, I get devil's food cake and a bit of espresso. Then, like a flick to the head, boozy bourbon takes hold, igniting my nostrils. It's potent, warming and complex. At first sip, there are equal parts coffee and dark cocoa. Some roasted caramelization brings balance, with a subtle Jagermeister-like snap. From there, it's all bourbon; sweet vanilla and toffee explode with a squoosh of oaky dryness. At the end, underneath it all is a hint of spicy-citrusy hops adding extra depth to the dense flavors. In the finish, coffee and toasted nuts linger, finally coming full-circle with devil's food cake. Full-bodied and ghostly viscous in the mouth, it's just barely above medium with some depth on the barrel-induced heat. Overall: Brewers will often blend their barrel-aged beers with a fresh batch of the same base beer. This has the benefits of stretching the beer's yield, as well as controlling the amount of barrel flavors present. This 9.6 percent ABV stout is not like that. It's a raw barrel-strength stout, dense and unapologetically rich in flavor. It coats the tongue like varnish and lets the whiskey aspects sing. I'd love to pair this with crusted pepper steak or maybe chocolate mousse with fresh raspberries. It's available to enjoy at home or appreciate at Strap Tank's brewpub. Barrel-Aged Saison: This one pours a surprisingly light golden hue—somewhat hazier than Strap Tank's typical saison. The head retention here is much improved over its Imperial stout brother, with a decent white fluff that lingers, leaving ridiculous lacing from start to finish. Right off the bat, the aroma has hints of green apple and musty wooded funk that gives way to an herbal earthiness from the hops. The taste starts sweet, with notes of unripened peach and bits of lemon. Next, dry chardonnay plays off the sweetness, adding complexity to both beer and wine. In all honesty, chardonnay has never tasted better—sorry, wine nerds. There's a ton of flavor from the barrel, and it blends perfectly with the yeast funk. Great fruity esters come through as well, and the hop selection lends a nice citrus element that works well with them. A faint hint of peppercorn and spice comes through at the very end, making for a wonderful ale. Overall: The initial sweetness can take one's tongue aback, but the oak, grape and 11.6 percent alcohol content manage to balance it all out. This is one of those beers that I'd really like to revisit this time next year to see how it's evolved. I'd recommend you do the same. It's also available to take home or sip at the brewpub. Strap Tank will soon be moving beyond the borders of Springville and add another full and independent brewery in Lehi. They'll make a nice little pair of boozy Utah County bookends, eh?